This spring, the college’s Gracenotes Volunteer Committee sponsored its second annual trip to New Mexico. A group of nine staff and faculty members traveled to Santa Fe to work with Habitat for Humanity. Here, one of the trip participants, Leslie Koval, shares her experience. Surprising, awesome, unique, colorful – a description of Tent Rocks National Park outside Santa Fe AND our Gracenotes Habitat for Humanity group. 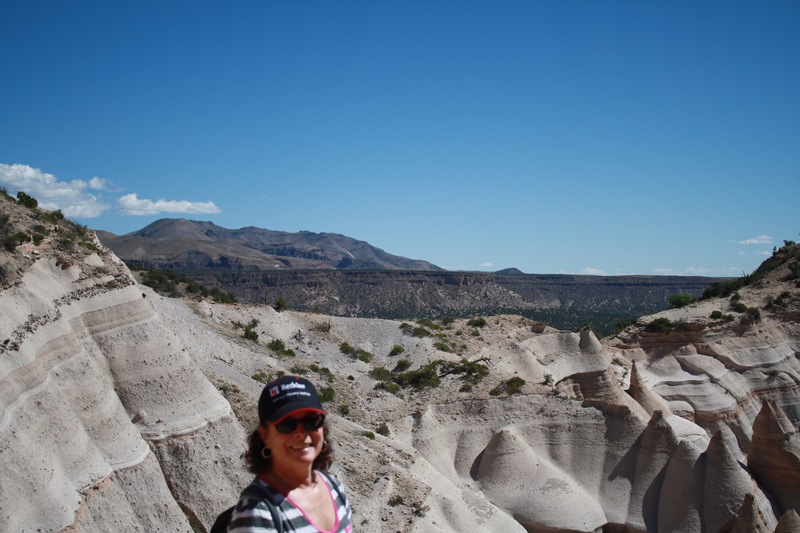 These similarities came into high relief on our first group outing, a hike around bizarre rock formations, through a narrow slot canyon, up steep slopes, past towering junipers, all under a deep blue sky. That evening, enjoying a desert sunset from a high perch on a ridge, we shared something about our lives, our jobs, and our reasons for joining this challenging adventure. Whether staff or faculty, whether graphic designer, social media expert, technical theater director, administrator, bursar or professor of voice or dance, whether from the College or the Conservatory, we found similarities as well as differences. This helped us form a team of efficient builders and construction workers that accomplished unexpected goals and had a great time in the process. 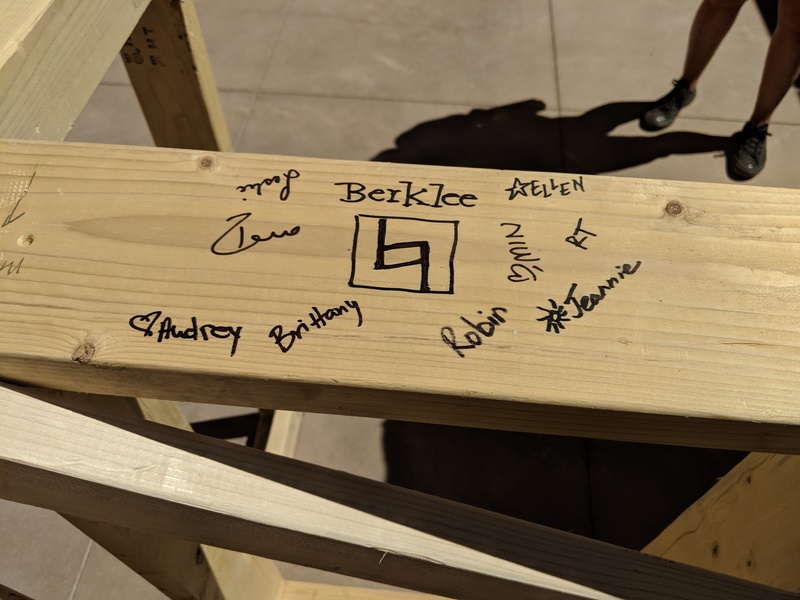 Forced to operate outside our usual skills, methods, tools, and instruments, we learned to measure with a T square, cut with a utility knife, apply caulking, insulation, and sealant, use a circular saw and welder, frame a house, build an adobe wall and construct a coyote fence. It was satisfying to see three Habitat homes progress toward completion because of our labor. Even more satisfying was working alongside the homeowners that are required to provide sweat equity as part of the Habitat program. Their stories were both sad and wonderful, propelled by hope for their families as future homeowners. The empowerment I feel as an agent of change in people’s lives and as an owner of practical skills I thought were beyond my abilities will resonate in all areas of my life. It will fuel a desire to explore the unfamiliar, accept the risk, and seek excellence both in and out of the classroom. Thank you, Berklee, for providing this fantastic opportunity. Leslie Shafer Koval has had a performing career in modern dance in NYC and Boston for 25 years. She’s been a professor of dance at Boston Conservatory for the past 25 years. She holds an MFA in dance from Sarah Lawrence College, and is a Certified Laban Movement Analyst from Laban/Bartenieff Institute in NYC. She loves the summer when she can garden, cook, bike, and swim.